“Remakes, adaptations, and sequels, that’s all Hollywood does now,” complain the same crowds who declined to see last year’s Pacific Rim, a genuinely new intellectual property which Legendary Studios gambled a ton of money on. You can’t both whine about Hollywood only making safe bets on established franchises while simultaneously refusing to check out a new thing because you don’t know what it is. I know what THIS is. It’s awesome. Pacific Rim is an odd & frustrating movie, though. Its flaws are glaring: Despite the bold & unusual step (in an era where we’re bombarded by origin stories) of beginning the movie late in a pre-existing conflict, it nevertheless feels like the sequel to a movie that never existed. It has gaping plot holes and people making nonsensical decisions. It grounds its more interesting characters & designs in the background and then dispenses with them too early. Its whole middle section is almost entirely free of action. It clearly foreshadows thuddingly obvious plot points, then delivers them like they’re huge revelations. Pretty much all its fights take place at night and many in or under water that it’s often hard to see what’s going on. And its willful adoption of nearly every cliche in the book (it openly steals from many films, but none more egregiously so than Independence Day) alternates between amusing and disappointing. Despite what some of its more ardent supporters claim, it’s not the next Star Wars… but with a little tweaking, maybe it could have been. Though even Perlman couldn’t have saved Transformers. So, anyway, Pacific Rim. Giant robots vs giant monsters, Voltrons vs Godzillas. In concept it’s a child’s notebook doodles brought to life, yet it executes with a winning mixture of straight-faced solemnity and wicked playfulness. What does all that clanging & smashing come down to? 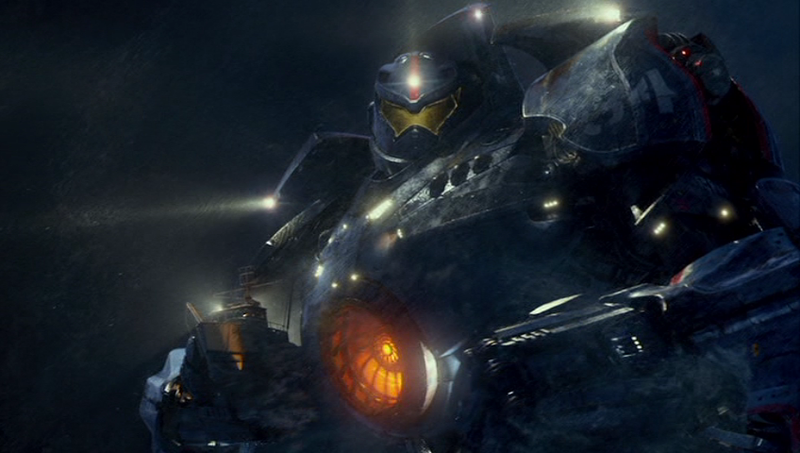 Gipsy Danger, our main “jaeger” (German for “hunter,” the film helpfully explains) as they call their giant robots here. Though one of the least visually distinctive machines in the movie, Gipsy still cuts a striking figure as a lean blue sentinel of justice. Despite being an earlier model, Gipsy is still plenty dangerous. Each of its hands can shift into enormous cannons capable of firing a handful (ahem) of deadly plasma bursts, though it takes a few moments to charge up. But Gipsy’s main offensive power is in direct physical combat, with blows administered by its skilled pilots. 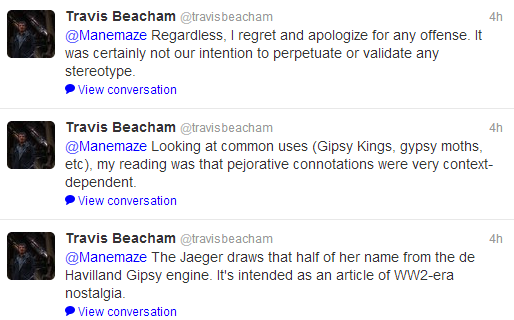 The unusual spelling of the somewhat un-PC term “gypsy” is apparently a reference to the de Havilland Gipsy engine. Piloted by: Yancy and Raleigh Beckett, two American brothers cocky from their four confirmed kaiju (Japanese for “giant monster,” more or less) kills thus far. They’re talented but their rash attitudes & egos are about to get them in over their heads. Played by Diego Klattenhoff and Charlie Hunnam, respectively. Knifehead, which is not its real name, if it even has one; all kaiju titles are assigned by some unseen person at UN HQ or whatever, mostly for tracking purposes. The reason behind each name is not always obvious, but this one’s pretty on the nose– specifically, Knifehead’s nose, as the top of his head is one super-elongated snout that comes to a sharp point. He also has extra-long arms with large claws at the end, and is apparently the first to exhibit anything resembling advanced tactics. It’s also big, ugly, and mean, but that describes literally every kaiju. Another thing the beasts have in common, unfortunately: while each is neat-looking, none really have anywhere near the iconic design or “personality” of the classic Toho B-movies that inspired them. But to be fair, what does? Grinning mischievously, the brothers decide to be Big Damn Heroes and go save the boat anyway. The film cuts away from Gipsy’s slow march into the water and takes us to the ship, the SS Saltchuck, getting buffeted pretty hard by storm waters even before Knifehead rises menacingly from the ocean. But shortly after, Gipsy Danger, accompanied by the soundtrack’s trademark Inception BWAAAAMP, arises on the opposite side of the monster. Without so much as a “come with me if you want to live,” the robot plucks the endangered ship out of the water. If not for the courage of the fearless jaeger crew, the Saltchuck would be lost. The Saltchuck would be lost. Even as our heroes cradle the (comparatively) tiny ship, it’s time for the fight to get down to business. 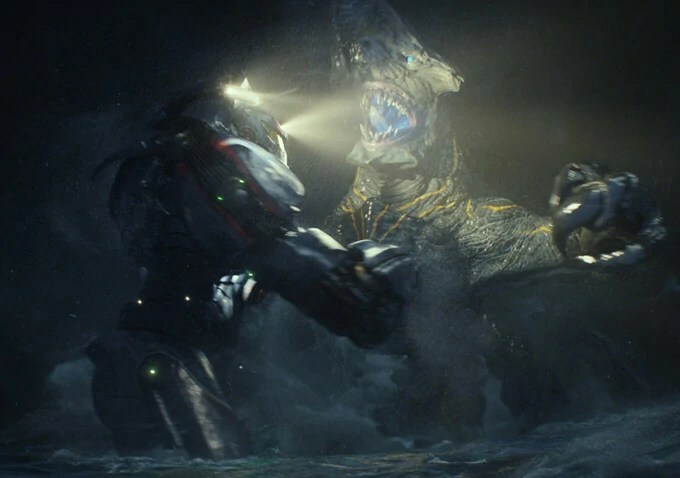 The Fight: From a far distance, Knifehead uses his long arm to take a swipe at Gipsy Danger, but only grazes the robot’s back as it leans down to put the Saltchuck out of the way. 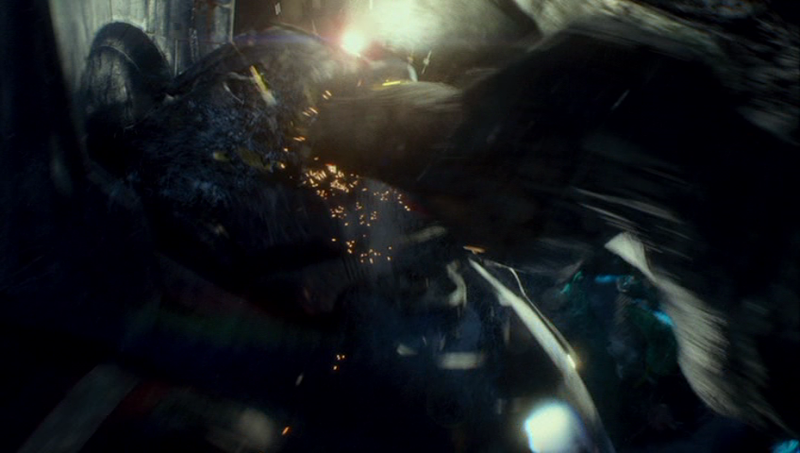 As soon as the ship is safe, Gipsy retaliates with a few punches, the second of which doubles the kaiju over. Gipsy then raises both hands up high and slams them down together on top of Knifehead’s, uh, knife-like head. The monster is hurt but not badly, and tries to lunge in with a chomp to Gipsy’s face, which the robot blocks and instead gives Knifehead a mouth full of wrist. The heroes are able to wrench themselves free and hit the kaiju with two shots of plasma, the second of which sends it flying back into the water. After Knifehead doesn’t emerge for like ten whole seconds, the brothers stupidly assume it’s dead and crow about their “victory” to Pentecost, who is irritated at them for disobeying orders. 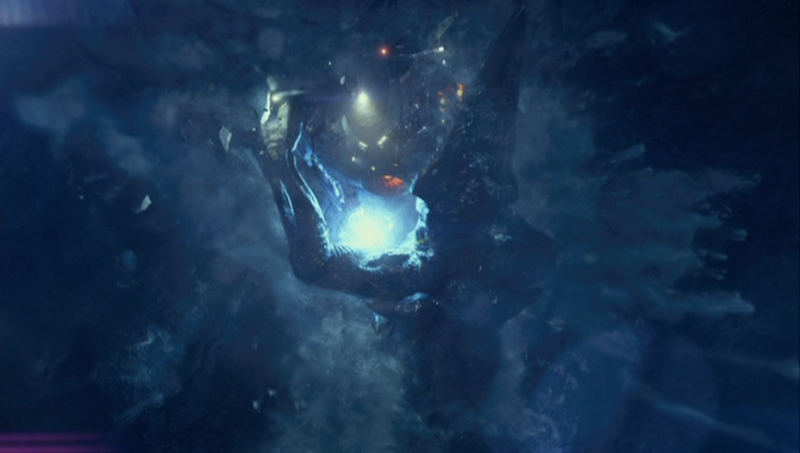 Sure enough, HQ starts picking up the monster’s signal again, moving too stealthily underwater for Gipsy to find. 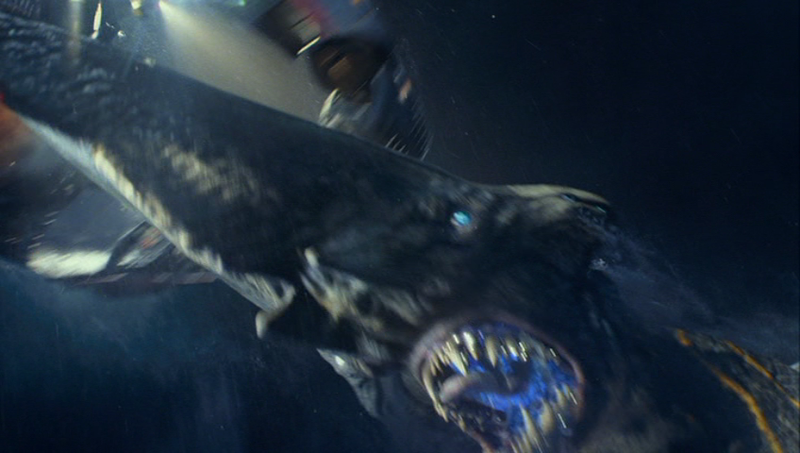 Before the boys can retreat, Knifehead suddenly jumps out from the waves and gets real close to the jaeger. Gipsy pushes it away and tries to charge up another plasma shot, but the kaiju pushes the blaster down with one long arm, then lunges in head-first at Gipsy’s shoulder. Knifehead’s ugly noggin cuts right through the robot’s left arm, leaving it useless and sending Raleigh (who controlled that hemisphere) into painful convulsions. Immediately after, the beast comes back in and yanks the arm all the way off, finishing the job. With Gipsy’s capabilities degraded and its pilots scrambling to react, Knifehead presses its advantage, getting in even closer and putting its claw right through the machine’s visor. Even the Three Stooges Defense couldn’t have stopped this. Even as Yancy tries to form a plan, Knifehead tears all the way through and unceremoniously yanks him right out of his virtual seat. We never explicitly see the older Beckett’s final fate, but, well, you can guess. Fortunately, the kaiju’s gleeful destruction seem to distract it long enough for Raleigh to slowly activate the plasma cannon on the remaining arm and fire it at close range. With that, the film cuts away and HQ announces that the plasma blast has cut off radio contact, leaving Gipsy/Raleigh’s fate in the dark. At least until a few minutes later (but the next morning in the movie), when we see Gipsy stumble and fall onto a barren Alaska beach. Though considering Raleigh’s been narrating for like the first ten minutes of the movie, you probably could have guessed he survived. There is not a lot to this fight–there are few moves involved, the action stays in one small area, etc– but it sets the stage pretty solidly for what’s to come. Though it’s clearly inspired by previous monster movies, Power Ranger-type shows & animes, and superficially resembles the action in Transformers films, the combat in Pacific Rim is something new entirely. There’s a truly gratifying sense of heft, a kind of slow & lumbering grace befitting their size and strength. It’s Big Dumb done smart. Also, even as we see the sheer power of the jaegers, we simultaneously learn just how precarious victory is in a fight like this. Just as in a real fight between humans, one small miscalculation can be the difference between life & death. Only here, the stakes are much higher. And bigger. “Big” is the operative word here. This is not a great fight (it’s just setting the baseline), but it is a big one. 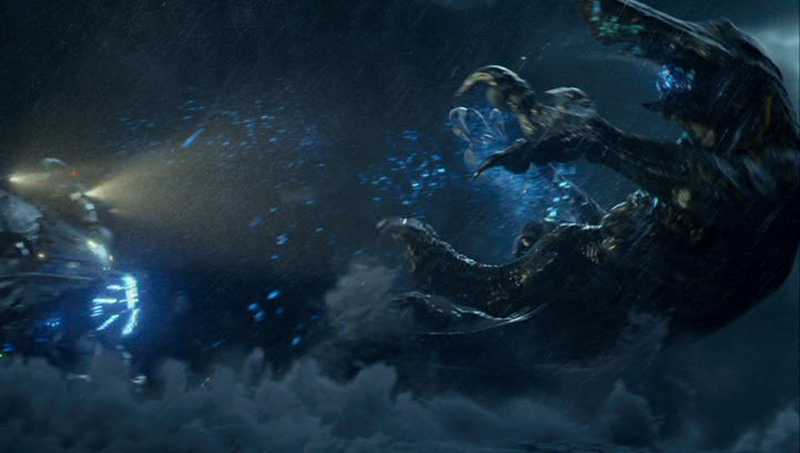 Just about everything Pacific Rim does is done enormously if not perfectly: the size and the loudness are rarely so awesome as they are in this film. And while that sounds easy– just turn all dials to the max and you’re good to go!– it really isn’t. As countless blockbusters and would-be blockbusters have taught us, you can have all the money in the world to pour into special effects, but if you can’t put it together skillfully and can’t put some real weight behind it, everything eventually dissolves into just so much bland noise. But not here. Here, the dials really do go to eleven. Coming Attractions: We hardly knew ye. Only the cool ‘bots die young. This entry was posted in Pacific Rim and tagged kaiju, one-on-one, Pacific Rim, robots, sci-fi.